This is post 2 in a 10-part Beginning Quilting Series. For most quilting projects I use 100% Cotton. Occasionally I will use vintage sheets or something else that is a cotton/poly blend. Try not to mix fabrics as 100% Cottons and Blends will wash and wear differently. That said, if you are making something like a memory quilt out of old clothes or something similar where you are mixing a variety of fabric types it will probably be fine – just keep in mind that different types of fabric will wear differently over time. I generally do not pre-wash my fabric I like the sizing that is in the store-bought fabric because I feel like it makes it easier to accurately rotary cut. If you stick to high-quality 100% cotton quilting fabrics that come from the independent shops or the higher-end selection at JoAnn, Hancock, etc. you should not have a problem with colors bleeding, etc. If the fabric is older or lower-quality I would suggest prewashing before you start cutting. There is more information about washing finished quilts here. Probably one of the most intimidating parts of beginning a quilting project is choosing just the right fabric. Here are a few simple tips to help in that process. There are two main factors to consider when picking fabrics for a project: color and scale. Color: Above is a collection I used for a recent quilt. First I picked a balanced variety of colors – especially lights vs darks (or in this case lights vs brights.) Then I picked different shades of the same color. Look at the oranges – they are all part of the same color family, but they are all different shades. 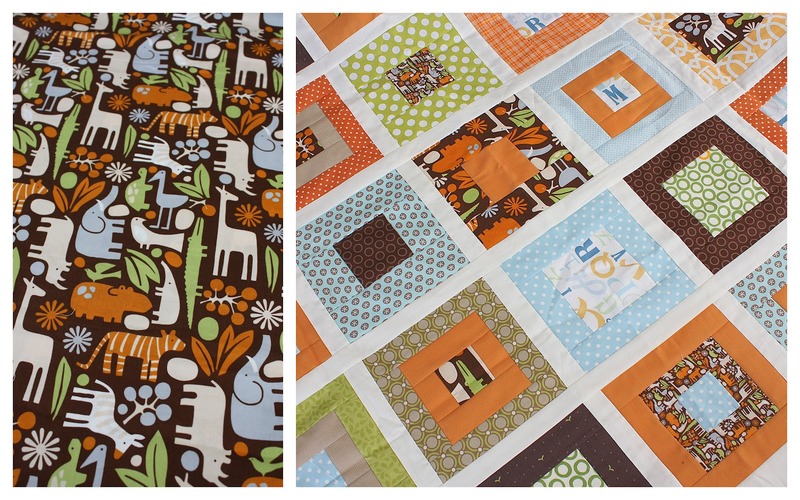 This will give your quilt a lot more visual interest. Fabrics colors that are too matchy-matchy (i.e. all the oranges are the same shade) will make your quilt feel flat. Scale or size: Currently there are some gorgeous large-scale graphic prints available. They are so fun to work with and make a really interesting quilt. But if every print you use is the same scale (size), your quilt will look out of control. There will be no place for your eye to rest and the beautiful big prints will just get lost. What we need is contrast. Not only in color, but in scale. So again, I divide my fabrics into groups by scale: Large, medium, and small.The large and medium scale prints are both busy and colorful but the design repeats are closer together in the medium scale prints. The small prints almost read as solids. They aren’t solid, but if you step back and squint your eyes they look like a solid color. These prints provide thecontrast for the busier large and medium size prints to really show them off. They provide a place for your eye to rest. You can use actual solids – which I sometimes like – but the design becomes more flat. With a small print ‘solid’ you get more ‘texture’ or interest to the quilt. Above are the fabrics I chose for the project we’re going to work on for this series. The 10 different fabrics are in the top left corner. I chose an equal balance of colors (2 fabrics per color) and tried to vary the prints’ scale for each color. When breaking down the fabrics by scale alone, there is also a balance of small, medium, and large. With the myriad of fabric designs out there to choose from, it can still be overwhelming to narrow down your options. I suggest picking one focus fabric first, then building your quilt around that one fabric. In this example above we chose the jungle print first and used it as our jumping off point for choosing matching colors. From there we went for a variety of scale options. When you’ve assembled your fabrics – and before you start cutting – stand back and look at the collection as a whole. Squint your eyes to change perspective. Is something too dominant? Something lacking? Now’s the time to change. If you are still experiencing some analysis paralysis about choosing fabrics there are some excellent products on the market right now that make great shortcuts. First of all, most designer fabrics come in collections with coordinated colors and a variety of print scales. Stick inside a collection and it simplifies your decision. Even better, fabric companies like Moda now feature pre-cut coordinated fabrics in squares and strips. One product called Charm Packs (above) contain about 40 different 5″ squares – at least one print from an entire collection. They also come in a pack of 10″ squares. 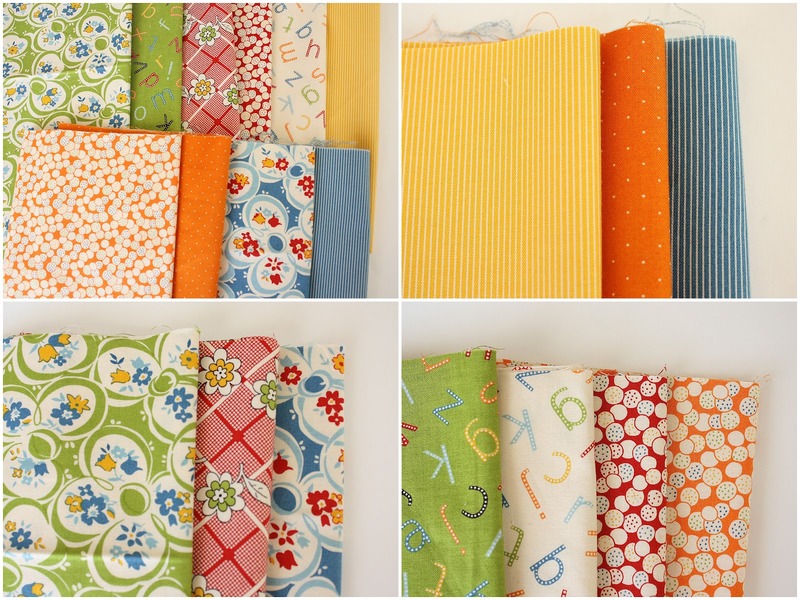 I frequently recommend Charm Packs to beginning quilters as a simple way to get a large variety and easily coordinated collection of fabric, without having to buy a lot of yardage. I have more detailed information on fabric stores, quality, collections, and lingo at this Fabric Shopping 101 post. 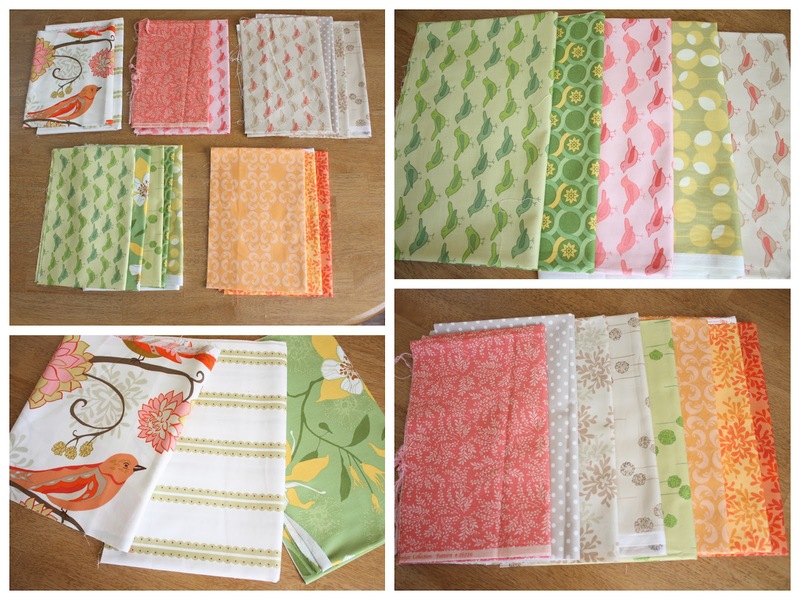 Many thanks to Lissa and to Moda for sponsoring the fabric for this series! I love your fabric selection! American Jane is my all time favorite! I can&#39;t wait to see how this turns out! I&#39;m really falling in love with Punctuation. I picked up a few FQs. That orange print with the little circles and dots is my favorite. Can&#39;t wait to see what you do with this! Shocked – SHOCKED – crazy move for you to use American Jane :)<br /><br />That Punctuation is going to look fabulous! I have been resisting Punctuation. But I think resistance is wearing thin….the colors and designs are just so wonderful. I&#39;ll be sorry if I don&#39;t have some of my own. Love your fabric selection and color palette. The four prints in the lower right side would be perfect in a children&#39;s quilt. Next time I have to buy fabric I&#39;m taking you with me. You have no idea how overwhelming I find this process. Thanks for posting all these tips. well done on the fabric selection! I just found this page this afternoon and wanted to thank-you for this great information on choosing fabrics, I always have trouble picking more than 3 or 4 fabrics. Love your fabric choices!! I am so glad I found your blog and tutorial. It was clearly described and the photos were great. Thanks for making fabric selection so much easier. I look forward to your next tutorial on design as that is an area I am unfamiliar with. I usually follow patterns or take a class and want to learn to design my own quilts (and have them fit together)! Thanks again. Hi Brittini! Thanks for your comment. 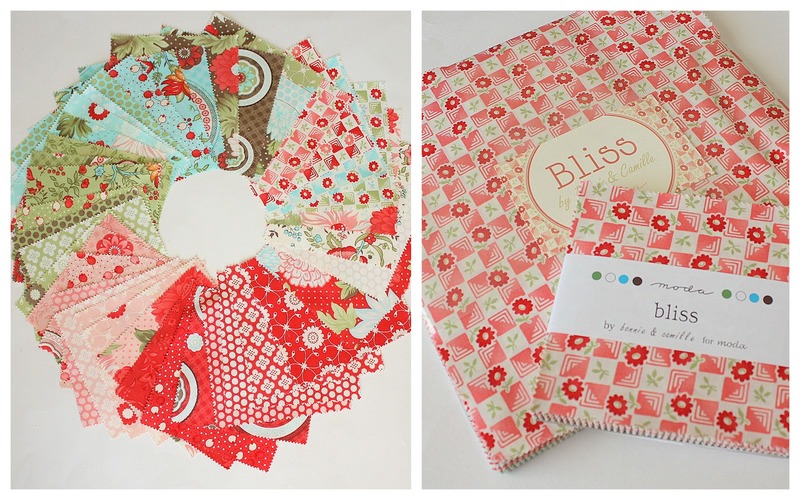 Sadly, Bliss is hard to find these days (although you could google Bliss Moda Fabrics and some might turn up!) Another similar collection by the same designers is available in stores right now called Vintage Modern. Same colors and cuteness, if you can&#39;t find any Bliss. Good luck! All of your quilts are so beautiful, but I love the Christmas and Autumn one the best. A friend I work with is going to get me started, I am sure I will frequent your page! I am new to sewing and really want to tackle a quilt. My daughter loves to go through my fabric and she thinks each cut of fabric is a blanket, ha ha. Pretty sure she has a few yards of fabric in her bed right now that she is using as blankets. I have a ton of flannel and I am thinking of using that to make a cozy winter quilt. Do you think flannel will work okay for a quilt? Yes – flannel works great for a quilt. A lot of people suggest washing flannel first because it shrinks a lot. Thanks for helping me understand that a quilt with matchy-matchy colors looks flat. I needed this tip because I am going to buy one for my mom. It will be a gift for her 50th birthday since she loves napping the most. It will be one the most used gifts in the future for her.